Apple Fruit contain vitamins like Vitamin C, Beta-Carotene, iron and potassium etc., The Vitamin C content may not be as good as Oranges but apples have very high mineral contents, pectins, malic acid which are good in normalizing the intestines. 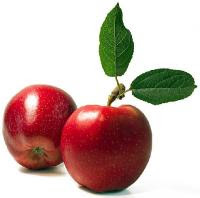 Apple Fruit is good for treatment of anaemia, dysentery, heart disease, headache, eye disorders, kidney stones and promotes vigour and vitality. Apple juice is good to overcome a liverish feeling, further, apples are unlikely to cause allergic reactions and are excellent means of providing essential fluids to the body. A number of components in apples, have been found in studies to lower blood cholesterol with a reduced risk of ischemic heart disease, stroke, prostrate cancer, type II diabetes and asthma. A new study whose findings have been published in the Journal of Alzheimer's Disease is sure to bring cheers for people suffering from this strange disease. Green Apples - Good for strong bones and teeth, aids in vision, anti cancer properties. Yellow Apples - Good for heart and eyes, immune system, reduce risk of some cancers.